Broncos win season opener for first time since 2008. 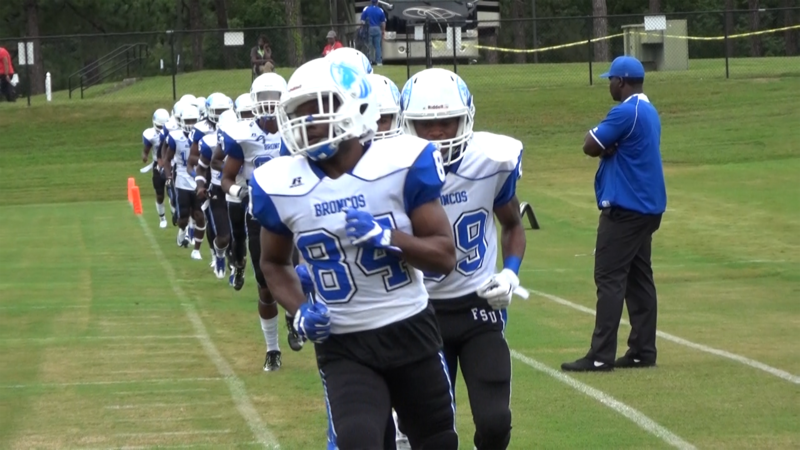 Murfreesboro, NC – Fayetteville State has seen its share of season-opener disappointments until Saturday night in Garrison Stadium. The Broncos will celebrate a long sought after victory after defeating Chowan University 24-21. The last time FSU won its season-opener was in 2008 when the Broncos defeated North Carolina Central 33-22 in Durham. Fayetteville State controlled a 14-7 lead at halftime. Chowan (0-1) scored on its first drive of the game with a 20-yard pass from Bryce Witt to Adrian McNeil. Fayetteville State (1-0) responded on the next drive with a four-yard walk into the end zone by quarterback Kane Banner(Lumberton, NC) with 5:58 left in the first quarter. The 8-play, 58-yard drive was setup by a 40-yard kickoff return by Brandon Smith(Raeford, NC). In the second quarter with 6:23 remaining, Donshel Jetton (Mooresville, NC) burst through the line of scrimmage to scamper 31 yards for a 14-7 lead, going into halftime. The defense played its part throughout the game forcing four fumbles and recovering two. Keyante Baldwin (Fayetteville, NC) recovered the Hawks’ last fumble of the game on an attempted punt return on Chowan’s three-yard line. Fayetteville State capitalized on the turnover as Banner plunged into the end zone from one-yard out. As time was about to expire in the third quarter with 38 seconds left, the Hawks picked up a touchdown to ease closer to the Broncos at 21-14. Witt connected with Michael Offutt, Jr. for a 32-yard passing touchdown. Preseason All-CIAA Kicker David Lamb(Pineville, NC) split the uprights with a 27-yard field goal with 12:31 left in the game and a 24-14 lead. Although Chowan scored its 21st point with 11:14 left in the game, the defense held its ground and preserved the victory. The score was a 50-yard pass from Witt to Torry Baker. Stevie Green (Washington, NC), the 2016 CIAA Offensive Rookie of the Year from, finished with 90 yards on 24 carries. His longest tote was for 23 yards. He shared snaps with Jetton who racked up 70 yards on nine carries and one touchdown. Jetton averaged 7.8 yards per carry. Brandon Smith returned three kickoffs for 124 yards. His longest return was 42 yards. Fayetteville State had an average field position of the FSU’s 38-yard line in the first half and the Fayetteville-40 in the second half. Fayetteville State will play host to Wingate University (1-0), who defeated Johnson C. Smith 38-18, on Saturday, September 9th at 6:00 p.m. The Broncos will show gratitude to the Armed Services with Military Appreciation Night.